It’s a girl for 16 and Pregnant Season 4 star Jordan Howard and her fiance Tyler Zeplin! 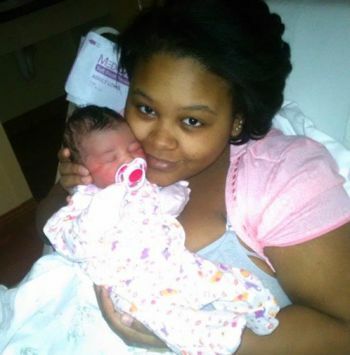 The 20 year-old gave birth to her second baby last night at a Pennsylvania hospital! She was induced because the baby was nine days overdue. The baby girl, who weighed in at 7 lbs., 2 oz., was named Skylar Aris by her parents. Anyway, Jordan announced her second pregnancy in December. She was actually already pregnant when MTV came to film her segment for the “Where Are They Now?” episode but, like her Season 4 co-star, Sarah Roberts, Jordan chose not to tell the producers that she was expecting again. Yet another Season 4 co-star, Kristina Head, recently gave birth to her third child. Jordan and Tyler have had one of the most successful ’16 and Pregannt’ relationships so far. They currently live together and plan to get married in 2015, according to an interview Jordan did for The Ashley‘s book, Teen Mom Confidential. Congratulations to Jordan and her family! Wow all unisex names… Tyler, Jordan, Chase, Skylar! CREEPIEST baby daddy ever, right? If I’m remembering them correctly.